Decorated with intricate, Celtic knot work, the Gaelic LARP Collection is expertly crafted for authentic and awe inspiring appearance as well as for ever important LARP safety. This collection includes LARP Axes with golden colored designs adorning their blades, elegant and powerful LARP Claymores, beautifully detailed round LARP shields, and more, all incredibly detailed for a historic appearance. Made of thick, industrial quality foam that resists shredding, each fiberglass core weapon features a latex coating and an elastic gloss finish for extra resiliency. The shields are crafted from the same, closed cell foam coated with latex and elastic gloss as well. With their authentic coloring, intricate detailing, and historic appearance, the Gaelic LARP Collection is sure to make a statement at any LARP event and, with proper maintenance, should last for LARP battle after battle. More than just protection, a trusted shield reveals what you stand for in battle. 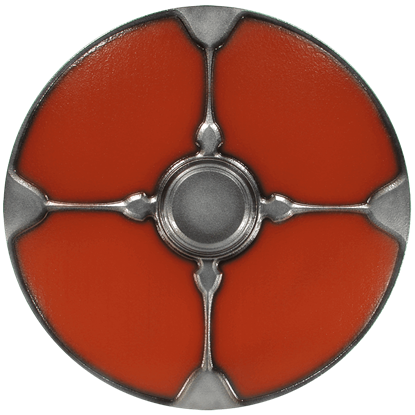 Whether you fight for your family, team, or yourself, the Gaelic Baldur Shield ensures you will be represented in style at your next LARP event. Going into battle with the right protection can give you an immediate advantage over your opponent. 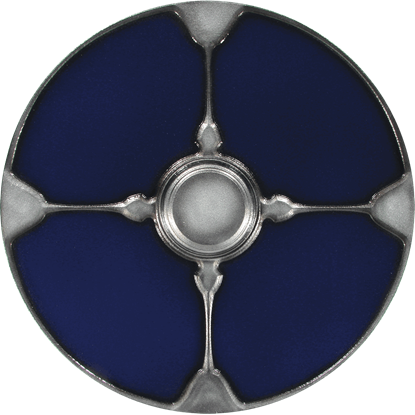 The Gaelic Blue LARP Shield is a Celtic-inspired piece that is ready to capably defend you at your next live action roleplay event. When you face your opponent on the battlefield, it is important to let your foes know you are serious. With the Gaelic Brown LARP Shield there will be no doubt about that. 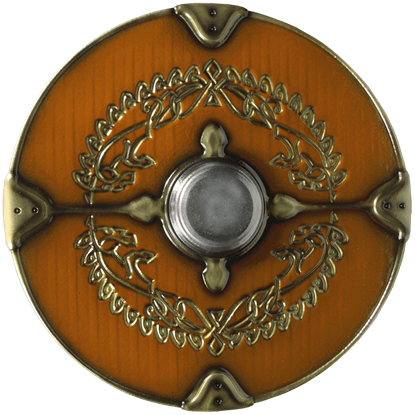 This Celtic-inspired shield is built for your protection. For double the chopping action, go with double the axe heads. 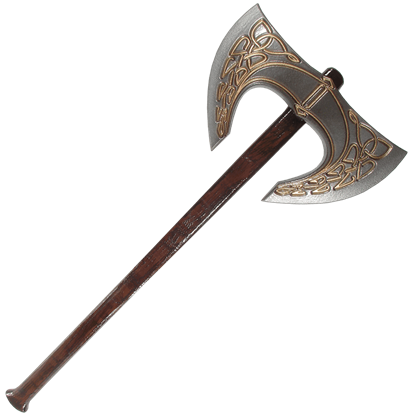 The Gaelic Double Headed LARP Axe presents an expertly crafted, dual bladed weapon ready to fight foes both left and right at your next live action roleplay event. 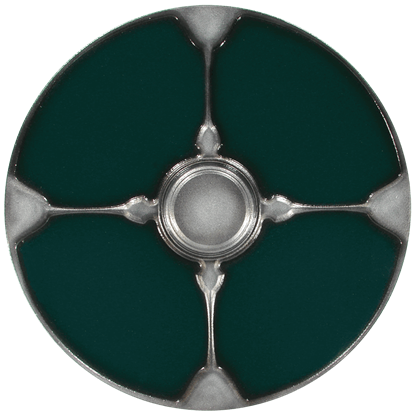 Presenting the color of ancient forests, detailed with silvery, metallic hues, the Gaelic Green LARP Shield is a stunning LARP defense tool. Made of polyethylene foam, this shield is ready to defend during your next LARP battle. 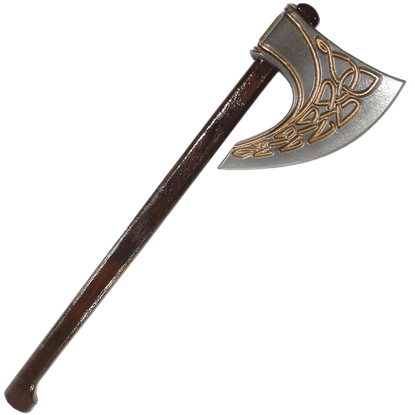 The Gaelic LARP Axe is more than just a LARP replica of a standard woodsmans tool or of a makeshift battle bludgeon. Golden colored Celtic-inspired designs adorn the foam blade of this expertly crafted, live action roleplay weapon. 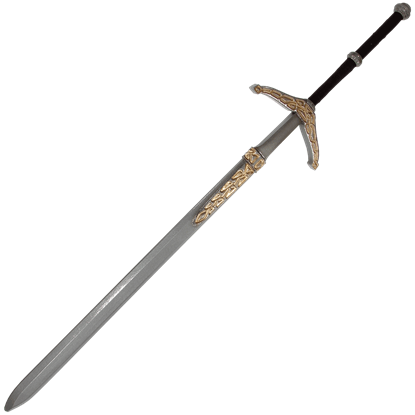 A traditional Scottish great sword, claymores are formidable weapons that typically require two hands to wield. Inspired by this late medieval blade, the Gaelic LARP Claymore features intricate, golden colored knot work designs. When it comes to close combat, sometimes it all comes down to the tip of your dagger. 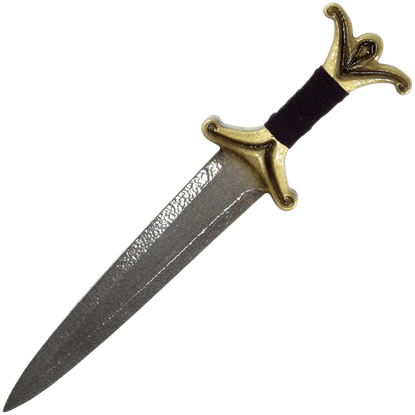 The Gaelic LARP Dagger, with curling details adorning its hilt, is an excellent choice for any LARPer looking to carry a small blade for defense. 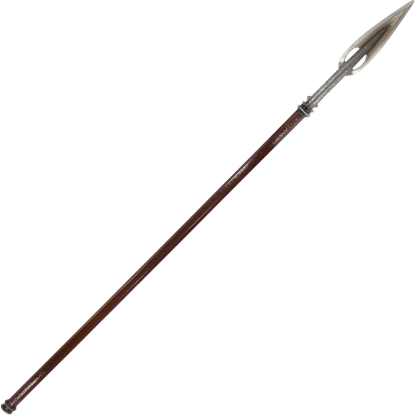 With over six feet of length, the Gaelic LARP Lance is a formidable pole weapon to wield in any live action roleplay battle. Made of high quality foam, this historic-inspired lance is a must-have when it comes to long range combat. Over a background of bright red, a golden dragon curls in an endless circle. 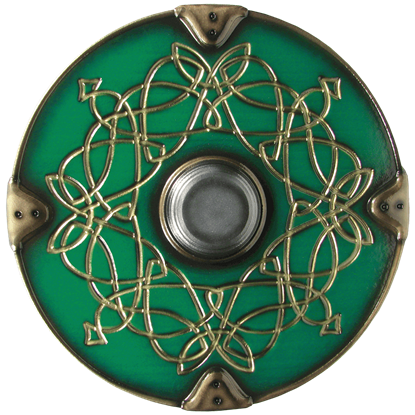 The Gaelic Morfang LARP Shield displays this Celtic-inspired design on its front with excellent attention to detail, expertly crafted for an authentic look. 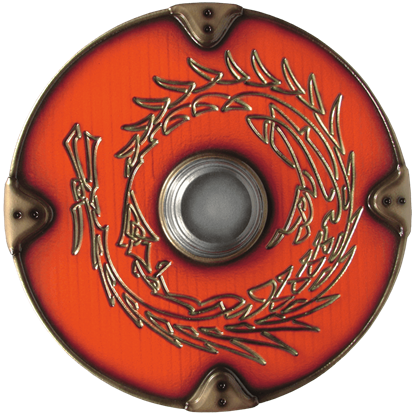 Defense is essential during any LARP battle, and the Gaelic Red LARP Shield is ready to protect in authentic style. Made of polyethylene foam, this LARP shield has been expertly crafted with eye-catching and realistic details. On a field of green, golden-colored Celtic knot work swirls and twists in an infinite pattern. 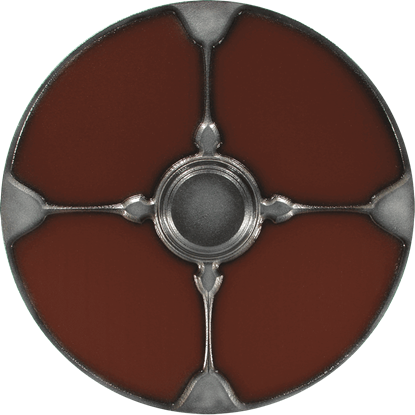 The Gaelic Skimir LARP Shield handsomely displays this historic-inspired look while providing excellent defense at your next LARP event.